In a future where the polar ice-caps have melted, and the Earth appears to be entirely submerged underwater, a mariner (Kevin Costner) struggles to survive and fight off outlaws as he reluctantly agrees to help a woman (Jeanne Tripplehorn) and girl (Tina Majorino) try and find dry land. 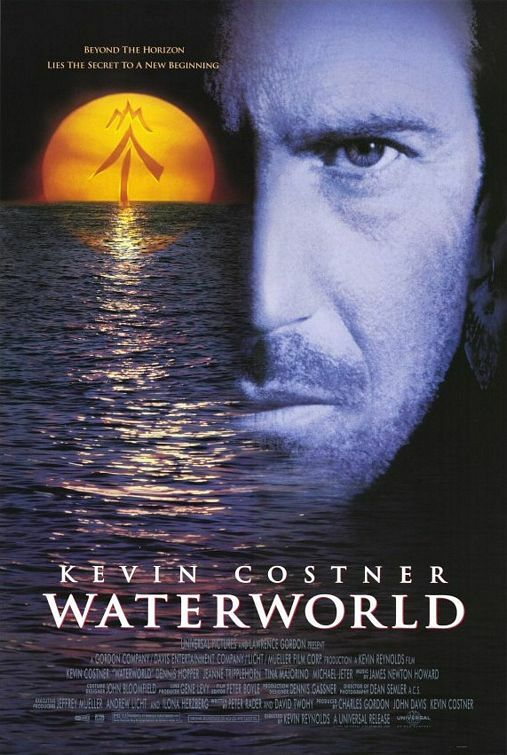 The world of Waterworld is fascinating and that is mainly because of the amazing sets and practical effects. This is a film that was clearly filmed on the open ocean, and the boats various characters have all feel lived in and an extension of the characters themselves. Especially the mariners boat, it’s an interesting ship and is clearly something he has adapted and maintained over many years. It’s made up from a motely assortment of materials and the stuff inside it is a mixture of stuff from the old world and equipment he’s made. Because of how the ships and characters clothes are all patched up, Waterworld almost feels timeless. The action set pieces still look good and that’s due to the practical effects, there’s fire and explosions everywhere and you believe the characters are right in the thick of it. The action is entertaining and it’s easy to follow, with there being so many wide shots so you can see jet skis jumping over walls, or the mariner dashing around his boat, to take out the bad guys. While the sets, costumes and the production design are all very good and help set this dystopian scene, the story and characters aren’t so great. The acting isn’t particularly good, Costner says so many of his lines in a monotone, that while the mariner is supposed to be a reclusive character, there’s not much to him that makes him compelling. Dennis Hopper plays Deacon, the villain of the piece and he spends most of his time shouting and is more like a pantomime villain than a real threat. The story itself is predictable but the scope of Waterworld has to be admired. 3/5.